Adidas India MD said that it is important to encourage girls to take up the sport and keep playing sport as they get older. Champion athlete Hima Das has been signed by sportswear company Adidas India for an endorsement deal. The company said in a statement that the athlete will now be equipped with the best products that Adidas has to offer for her racing and athletic needs. Hima Das, who is only 18, is popularly known as the 'Dhing Express' and the 'Golden Girl'. She made history by becoming the first Indian athlete to win a gold medal at a world event, when she bagged a gold medal at the women's 400 m at the IAAF World Under-20 Championships in Finland. She continued her winning streak when she bagged a gold and two silvers at the 18th Asian Games in Indonesia recently. Das said that she hopes her performances reach the next level with Adidas' sportswear. "I feel extremely proud to join the Adidas family and be a part of a great group of global athletes. Adidas has an incredible track record for helping athletes across sports and enabling them to reach the peak of their sport. With them, I hope to take my performances to the next level on the field and also help create change off it. Our aim together is to improve participation of Indian youth in sports and women empowerment and I am confident of creating the change with Adidas," said Das. Hima Das even took to Twitter to show her new custom-made shoes that has her name on one side and "create history" on the other. 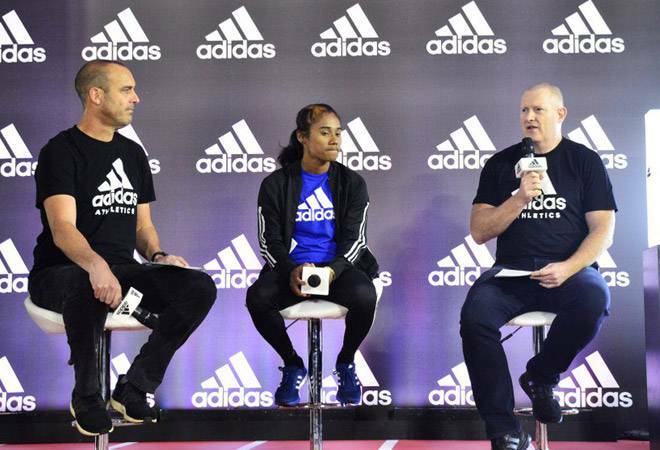 Dave Thomas, MD, Adidas India said, "At Adidas, we believe that 'through sport, we have the power to change lives' and Hima is a great example of this. Many of our associations and partnerships are focused on empowering youth in India and making a positive change. We at Adidas also believe that as the leading sports brand in India it is important to encourage girls to take up the sport and keep playing sport as they get older. Over the last couple of years, Hima and many other Indian women have emerged as torchbearers with their outstanding performances. Adidas is very keen to support India's youth and to build a stronger sporting spirit and ambition in them", as mentioned in a report in The Economic Times. Other Indian athletes like Rohit Sharma, Rishabh Pant, Dipika Pallikal, Kuldeep Yadav, Zeel Desai, NikhatZareen and international athletes including Naomi Osaka, Lionel Messi, Paul Pogba and Caroline Wozniacki have represented the brand before.